Piro eased back on the throttle and the ship came to a stop. "All right," he said. "We're here." Thomas' floating head flickered out of view and was replaced by a light rapping on the passenger side window. Piro pressed a switch and the window slid down. "This way, my man," Thomas said, motioning with his thumb. "This is our guy on the inside. Goes by the name of 'Freeway Ricky' Ross. Real name Rick." "Pleased to make your acquaintance, Rick." "We've been making a lot of progress. We did three hundred million last year in uncut bricks. But Ricky's got a line on some sweet chemistry and we've been able to step on these new shipments up to ten times before sending them out to the street. And it sells just as well as the raw." Piro made a low whistle, pretending he understood what Thomas was talking about. "The small-time dealers love it. Maximal return on a minimal investment." "I own five houses," said Ricky. "It's become an epidemic," complained Thomas, suddenly forlorn. "Crack is flooding our streets." "But--" Piro's face contorted in spite of himself. He couldn't decide if Thomas was being sarcastic. "But you're the ones selling it!" "We fold all the profits back into the war on drugs." "That makes no sense at all." Piro shook his head. "That's exactly why we need your help. I feel there are still some kinks left in the process that need to be worked out. Something has to be done about this and quickly. People are dying out there, Piotr." Freeway Ricky Ross leaned back against the hood of his Impala. He hated this part. Waiting for Thomas to pitch some new investor was more boring than going to church. He got out his briefcase and went over some overdue paperwork. New lawyer, couldn't read his hand writing. Snapped the briefcase shut and smoked a cigarette. Noticed that he had scuffed his Chuck Taylors. Piro and Thomas had taken a circuitous route around the abandoned parking lot, and now they were making their way back towards Ricky. They seemed to still be discussing the preliminaries as their voices drifted back within earshot. "Basically, I bought the Chrysler Building." "Don't look at me like that. We needed the room." "You founded a super-hero team -- funded by drug money -- to fight drug dealers." Piro felt that his eyes were popping out of his head. Thomas was almost thirty years old. This kind of self-defeating behavior was inexcusable. But he had managed to amass some impressive resources. Piro stared off into the Los Angeles smog, weighing the situation. "Almost nothing about this appeals to me. Except for a few of your acquisitions. 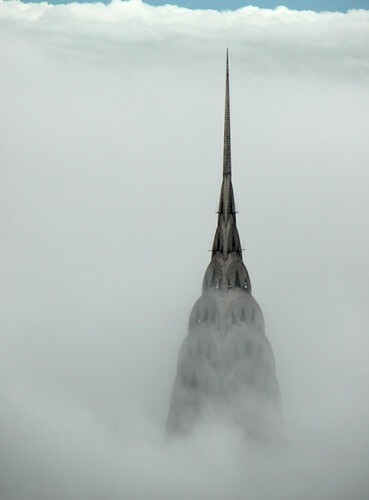 Did you know that the Chrysler Building is still standing in 4086? Owned by the Crown." "Actually, I operated out of the 61st floor for several years, training recruits." "Yeah, I remember your training. Dad really had a hard-on for your methods. He always used to tell the rookies, 'If you survive one of Piro's seminars, you're hired.' Seemed to think that was hilarious. Of course, later I told him all about your Blythe collection." "Who do you think got me started on the doll collecting, idiot," Piro laughed. Thomas smiled at him, warmly. "Well Thomas, I'm a little perturbed that you've brought me back here under false pretenses. Crack cocaine is hardly going to swallow the known universe. But now that I'm back, what the hell. I can see that you've got a heaping full plate. You're going to need all the help you can get dealing with this problem you've unleashed. It probably wasn't a bad idea to get me involved." "I'm sure dad would agree." "Please tell me he doesn't know about this," admonished Piro. "Relax," said Ricky, flicking his cigarette over the hood of the Impala. "He's in Japan." "The man has access to the mesh, Rick." Piro made a face at him, "If he's not already involved in this it probably just means you haven't been paying close enough attention to the books." "I resent that," said Ricky. "We spend a lot of money on accountants." It felt strange to once again be standing on the 61st floor observation deck. Piro tilted his head so that his bangs partially shielded his eyes from the setting sun. Thomas was already asleep and 'Freeway Ricky' had stayed on in L.A., so Piro had most of the floor to himself. As he gazed out over the city he wondered if Thomas realized he had burnt all of his fuel -- that the Ragnarok was parked indefinitely within the present temporal frame. The percept drive had run clean out of new perspectives. No matter. It was true that there was a lot of work to be done. It could hardly make a difference if Thomas had deliberately deceived him. It would make little sense for Piro to complain of being lied to by his brother at this late stage in the game. He took nothing personally and took everything in the context of their previous history. There was a lot to consider, and petty manipulations were not at the forefront of his mind. He did seem confused on a few points. Small details were not as he remembered them. For instance, If he and Thomas were twin brothers, then why was his apparent age approximately ten years greater than that of his brother? Additionally, if Thomas Bright, Sr., was his father, then why did he clearly remember being regaled in his youth as the spitting image of a long line of French military scholars, whose family, coincidentally, raised him to young adulthood in the French countryside? Why was his name Russian? He paid none of this any mind. He resolved to focus solely on his mission: stopping the crack cocaine epidemic before it destroyed the country, if not the entire world. Piro checked his weapons and unlatched his backpack. He withdrew the necessary equipment and launched himself over the wall of the observation deck, repelling down the side of the Chrysler Building with deliberate speed. The sun reflected against the skyscraper's metal skin as Piro descended its smooth, featureless surface, pacing himself to the rhythm of the city.